There is something about Italian figs that inspires intense loyalty. And our dried figs from Cilento by Santomiele are the perfect example of that. These figs are a precious variety of white fig from Campania, which are dried and stuffed with raisins, Sicilian almonds, and candied orange and lemon peel, and soaked in a splash of rum and fig molasses. The result is an incredible combination of aromas, flavors, and textures that captures the best of southern Italian tradition in delicious little bundles - or “fagottini” in Italian. 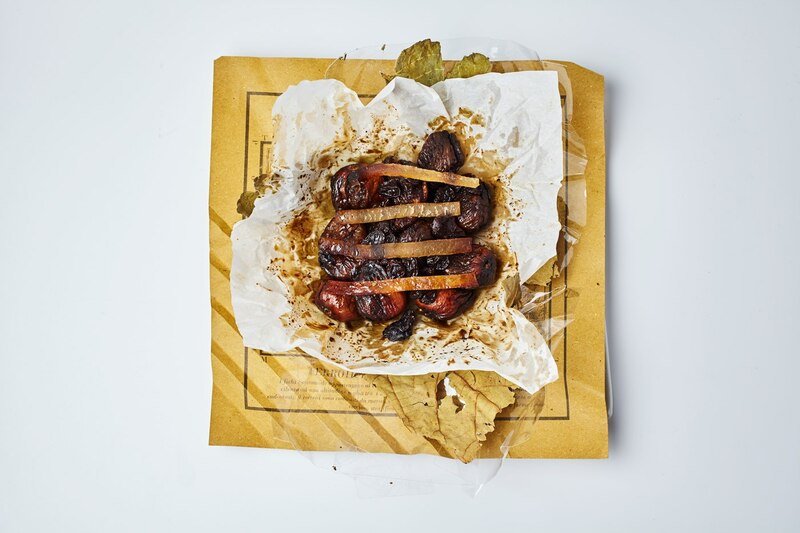 The figs are wrapped in their own leaves and packaged in rustic paper with an old map of the growing area in Cilento printed on the inside. Antonio Longo of Santomiele is very choosy about who he lets carry his figs, so we’re proud to be able to offer this unique gift for fig lovers! But because Antonio uses only the highest quality, seasonal ingredients, production is limited; this is a delicacy you won’t want to miss, so get them while you can. Santomiele Fagottini are made from a unique variety of fig called Dotatto Bianco found in Cilento; these exceptional figs are prized for their dense, extra sweet pulp and small seeds that give them a pleasant mouthfeel. With over 600 varieties of figs in Italy, this one stands above the rest, selected by the European Community for DOP status. The figs are harvested at the peak of ripeness and dried in the sun for five to eight days, rotated at least once a day to maintain a uniform color.